A former employee of the Arizona Memorial Museum Association has admitted stealing $170,000 from her employer in 2005. Fe Nakahara, 43, of Waipahu pleaded guilty yesterday in U.S. District Court to larceny and filing a false federal return that failed to report the stolen proceeds. Assistant U.S. Attorney Clare Connors said Nakahara had been working as an accounting and human resources assistant for the nonprofit organization since early 2002. The association financially supports the National Park Service. Her duties included verifying daily receipts for deposit. In May 2005 the organization began noticing discrepancies in the deposits and began looking into the matter. An investigation revealed Nakahara had taken cash amounts totaling $170,000 from May to August 2005. Nakahara apparently used the cash for personal expenses for her and family members, including golf clubs for her boyfriend and a birthday party for one of her grandchildren, Connors said. She will be sentenced Feb. 14 by Chief U.S. District Judge Helen Gillmor. She faces a maximum of five years for the larceny and three years for the false filing. Shanlyn Park, assistant federal defender, declined comment. WAILUKU » The executive director of the Kahoolawe Island Reserve Commission plans to step down at the beginning of next year. Sol Kaho'ohalahala announced his retirement effective Jan. 1. Kaho'ohalahala, who became executive director in January 2005, instituted programs including strict budgeting to extend the life of the trust fund to restore Kahoolawe, said commission Chairman Dr. Emmett Aluli. A group led by interim Executive Director Michele McLean has been selected to begin the search for a new executive director. Crews began taking down part of the emergency sewage bypass along the Ala Wai Boulevard on Tuesday as the city's Beachwalk Wastewater Emergency Bypass project enters its final phases, according to a news release. One lane of Ala Wai Boulevard will be blocked between Walina Street and Seaside Avenue weekdays from 8:30 a.m. to 3:30 p.m. until the work is done. When the pipes are removed, on-street parking will be restored along that stretch, the city's public information contractor said. Pipes might be left in place between Seaside and Lewers Street as an emergency backup, but taking out pumps and barricades will restore more on-street parking and the bike lane. Work continues at Kuhio Avenue and Kaiolu Street in an underground vault for controls. When work is complete, the vault will be covered with concrete decking. The emergency project began in May 2006, following a March spill of 48 million gallons of raw sewage into the canal when an aging pressurized sewer line broke. More details are available at www.beachwalkbypass.com or 543-8374. 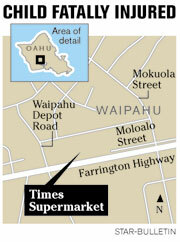 A 1-year-old girl died yesterday after he was struck by a van in the Waipahu Times Super Market's driveway. Police said the van driver, a 62-year-old man, was exiting the driveway at 94-766 Farrington Highway at about 5 p.m. when the girl darted from the west sidewalk into the van's path. The girl was taken to Hawaii Medical Center West in critical condition and died at about 5:10 p.m. The driver of the white 1986 Chevrolet van was not injured. Police said it was Oahu's fifth non-traffic fatality, which occur off public roadways, this year, compared with two at this time last year. Police arrested a 20-year-old woman Tuesday who allegedly stole night deposits from her employer. Police said the suspect was to make cash deposits at the end of the night shift on Sept. 14, 16 and 20 for the Pearl City retail store where she worked. Bank employees later discovered that the deposit bags had been cut open. Bank officials notified the store manager, who questioned the suspect. The suspect allegedly admitted she was involved, and police arrested her on suspicion of one count of third-degree theft and two counts of second-degree theft. A 41-year-old woman who was stabbed to death Tuesday was identified yesterday by the Honolulu Medical Examiner's Office as Chong Suk Waraksa. Waraksa died of multiple stab wounds to her chest, according to the autopsy. A 42-year-old man allegedly stabbed Waraksa before dying about 30 minutes later. Witnesses said he deliberately rammed his truck into a wall in Salt Lake at about 2:40 a.m. He died at the scene. The Medical Examiner's Office has yet to identify the man. Waraksa was taken to the Queen's Medical Center and died at 3:18 a.m.
Police arrested a 35-year-old man who allegedly broke into a woman's Waikiki apartment last month and injured her. Police said that at about 3:30 a.m. Sept. 9, the suspect forced his way into the 29-year-old victim's apartment and restrained her while causing some bodily injury. Police said the suspect was later identified through a photo lineup. He was arrested Tuesday on suspicion of first-degree burglary and kidnapping. Police have arrested a man who allegedly escaped from a state mental facility four years ago. At about 7:30 a.m. Tuesday, police responded to a complaint at a restaurant at 2310 Kuhio Ave. Officers learned that one of the men allegedly involved in the disturbance was an escapee from a state mental facility. Police arrested the man, 30, on suspicion of second-degree escape. He was allegedly found with brass knuckles, and was arrested on suspicion of possession of a deadly weapon. Police are asking for the public's help to locate an unknown man who tried to kidnap a girl in Waipahu yesterday. At about 7 a.m. the juvenile was walking on Aiki Street when a white Ford van pulled up next to her, police said. The driver offered her a ride and attempted to pull her into the vehicle, but the girl broke free and ran to a friend's house. Police said the suspect is in his late 20s with black eyes and a dark brown complexion. He is 5 feet 7 inches to 5 feet 9 inches tall and wore a white T-shirt with jeans covered in dirt.